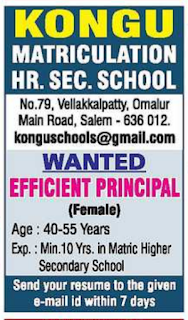 Kongu Matriculation Higher Secondary School, Salem has advertised in THE HINDU newspaper for recruitment of Principal jobs vacancies. Interested and eligible job aspirants are requested to apply with in 7 days. Check out further more details below. Name of the School :Kongu Matriculation Higher Secondary School, Salem. About School:Kongu Matriculation School is established by the Kongu Vellalar Trust, with the sole objective of imparting education of high quality. As the trust is financially sound and service is its only motto, its intention to develop the school into a model Higher Secoundary School has materialized in the shortest possible time.There is a general feeling that children educated at Matriculation School are drawn away from our culture. So, the management intends to emphasise the cultural content of education imparted at the school. The students of the school are expected to have a broad outlook academic brilliance and adequate communicative ability in acceptable English. 40-55 years of age preferable. 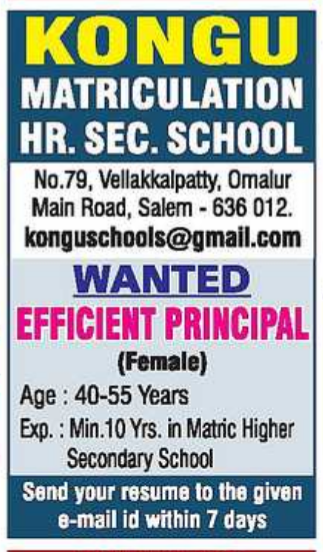 Minimum 10 years of experience in Matric Hr Secondary school. How to apply: Interested candidates may send with their resume to mail id with in 7 days.